Definition at line 6 of file cardstack.h. Definition at line 11 of file cardstack.h. Referenced by Pop(), and Top(). Definition at line 228 of file cardstack.cpp. Definition at line 37 of file cardstack.cpp. Referenced by CardRegion::Clear(), CreateSol(), DeckClickProc(), and NewGame(). Definition at line 192 of file cardstack.cpp. 207 //put index into reverse range.. Definition at line 42 of file cardstack.cpp. Referenced by CardRegion::NewDeck(), and NewGame(). Definition at line 14 of file cardstack.h. Referenced by CardRegion::CalcApparentCards(), CanDrop(), CardRegion::Clip(), DeckClickProc(), CardRegion::GetNumDragCards(), CardRegion::MoveCard(), CardRegion::NumCards(), CardRegion::PlayCard(), CardRegion::PrepareDragBitmaps(), CardRegion::PrepareDragBitmapsThreed(), Push(), CardRegion::Render(), RowStackDropProc(), StackDropProc(), SuitStackDropProc(), CardRegion::UpdateFaceDir(), CardRegion::UpdateSize(), and CardRegion::ZoomCard(). Definition at line 112 of file cardstack.cpp. Definition at line 119 of file cardstack.cpp. Definition at line 100 of file cardstack.cpp. Definition at line 106 of file cardstack.cpp. Definition at line 10 of file cardstack.cpp. Definition at line 16 of file cardstack.cpp. Definition at line 127 of file cardstack.cpp. Referenced by DeckClickProc(), CardRegion::MoveCard(), NewGame(), CardRegion::OnLButtonDown(), PileRemoveProc(), and CardRegion::Pop(). Definition at line 135 of file cardstack.cpp. Definition at line 222 of file cardstack.cpp. Definition at line 83 of file cardstack.cpp. Referenced by CreatePlayDeck(), DeckClickProc(), operator+(), operator+=(), CardRegion::PlayCard(), and CardRegion::Push(). Definition at line 89 of file cardstack.cpp. Definition at line 172 of file cardstack.cpp. 177 //put index into reverse range.. Definition at line 73 of file cardstack.cpp. Referenced by DeckClickProc(), and CardRegion::Reverse(). Definition at line 50 of file cardstack.cpp. Referenced by NewGame(), and CardRegion::Shuffle(). Definition at line 151 of file cardstack.cpp. Definition at line 159 of file cardstack.cpp. Definition at line 8 of file cardstack.h. Definition at line 47 of file cardstack.h. Referenced by CardStack(), InsertCard(), NewDeck(), operator(), Pop(), CardRegion::PrepareDragBitmaps(), CardRegion::PrepareDragBitmapsThreed(), Push(), RemoveCard(), CardRegion::Render(), Reverse(), Shuffle(), and Top(). Definition at line 48 of file cardstack.h. 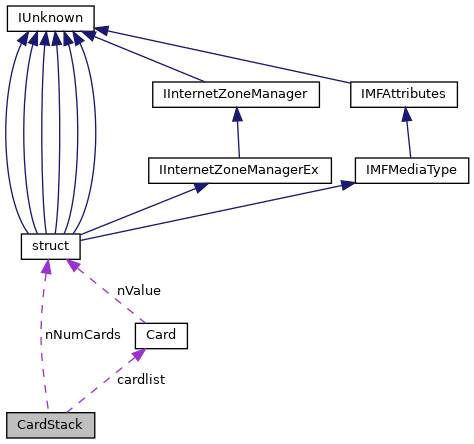 Referenced by CardStack(), Clear(), InsertCard(), NewDeck(), NumCards(), operator(), Pop(), Push(), RemoveCard(), Reverse(), Shuffle(), and Top().